For the last few weeks, I've become more and more interested in the blog and forum surrounding Mr. Money Mustache (I added a link, so you could go check it out). While I'm unlikely to ever consider myself mustachian (and frankly, probably also too materialistic), I've really found a lot of sense in his advice and commentary about consumer spending. And that in turn has led me to examine my own spending a little more closely. And I've realized that, just like so many others, that I do a lot of impulsive and completely unnecessary spending (exhibit A, my shoe collection, exhibit B, my dress collection, and exhibit C, my extensive kitchen gadget and serveware collection. I've been in contact with Raise.com regarding Hallowe'en related post that mentioned their service, and I was kind of scratching my head as to how to link both Raise.com (a gift card buy and sell site) and Hallowe'en, and also rationalize this under my newfound frugality. I'm not sure I'm succeeding, but anway. (As an aside, I will start with a bit of bad news first, for my Canadian readers, Raise.com is not currently able to process international orders (that said, you can check out the similar Canadian service of CardSwap.ca)). I actually find this idea quite frugal - essentially, if you find yourself with a gift card you can't use, rather than buying something you don't actually need, you can sell it. Likewise, if you're planning to spend money in a given store, you can acquire a giftcard for that store at a discount (which, combined with whatever other offers you can find for that store, can offer you a pretty great deal, particularly when it's money you planned/needed to spend anyway). I spot a TON of Home Depot gift cards on the site, and saving an additional few per cent off home improvement materials strikes me as a good deal for sure. Of course, it's not a great deal if you spend money you either don't have or didn't plan on spending. Anyway, so how exactly do we link this to Hallowe'en??? 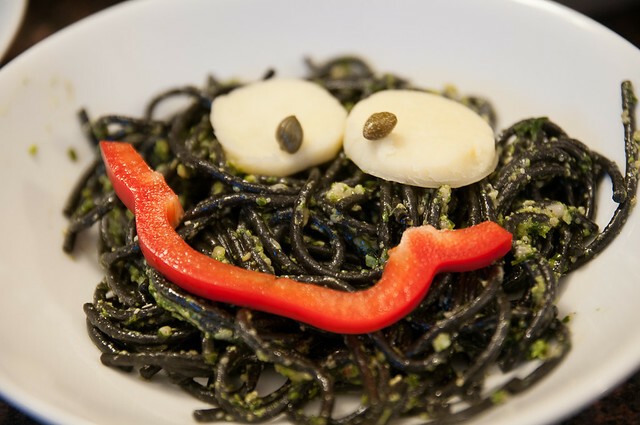 Well, the thing is, I had some ideas for a fun Hallowe'en dish; one that would be super simple to put together and quick enough to get on the table between getting home from work/school and trick or treating, but that would also offer a little bit of fun. 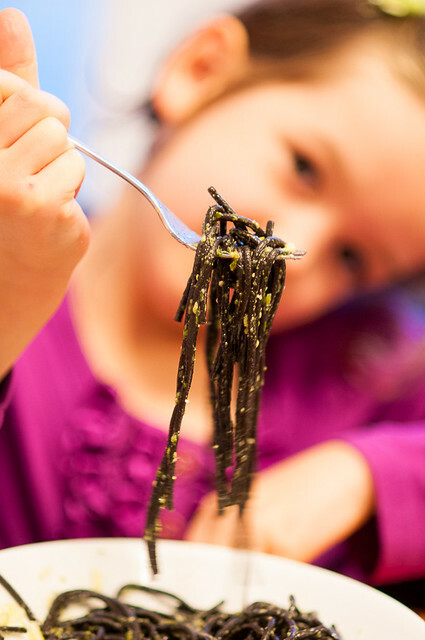 This black monster pasta was a HUGE hit with our entire household. 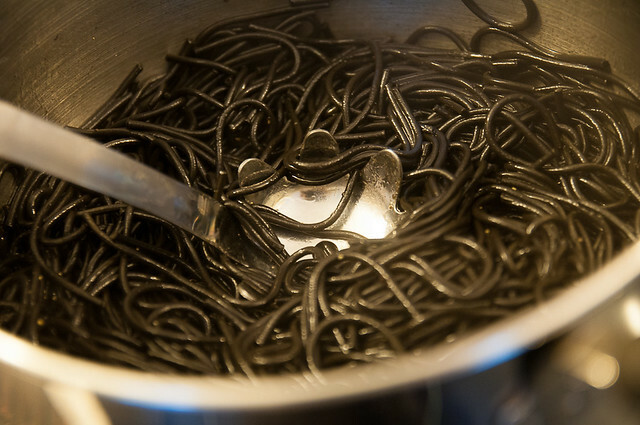 I happened to have the black pasta on hand already (President's Choice Black Label), but will admit it was a total impulse purchase and quite expensive compared to typical pasta; this dish would work equally well with white or whole grain pasta, though I did find the black noodles especially ghoulish. 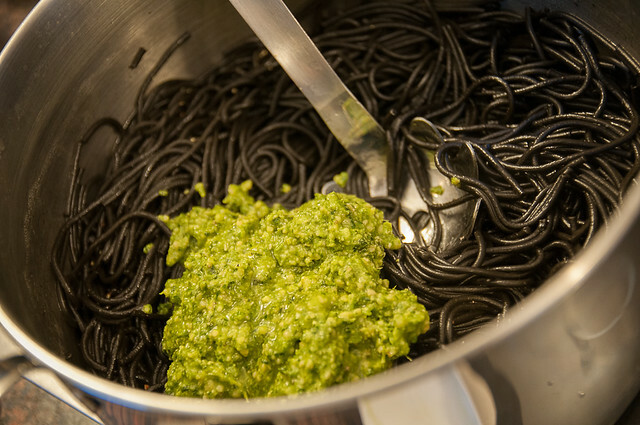 I also had some of my favourite pesto from Costco on hand, so I used that up (though again, a tomato sauce or cream or rose sauce would also work just as well). 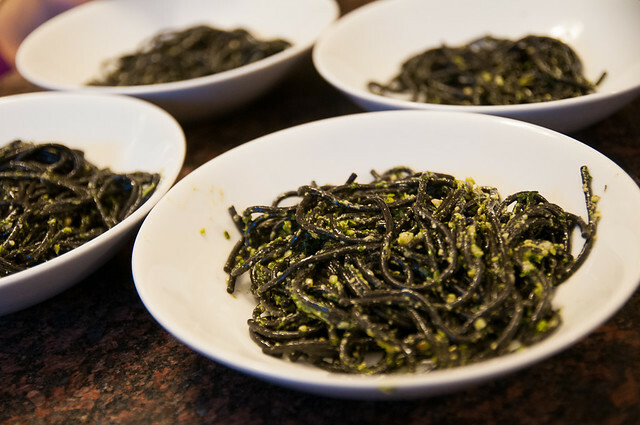 But you have to admit that the green pesto on the black noodles is great for that extra gruesome touch. 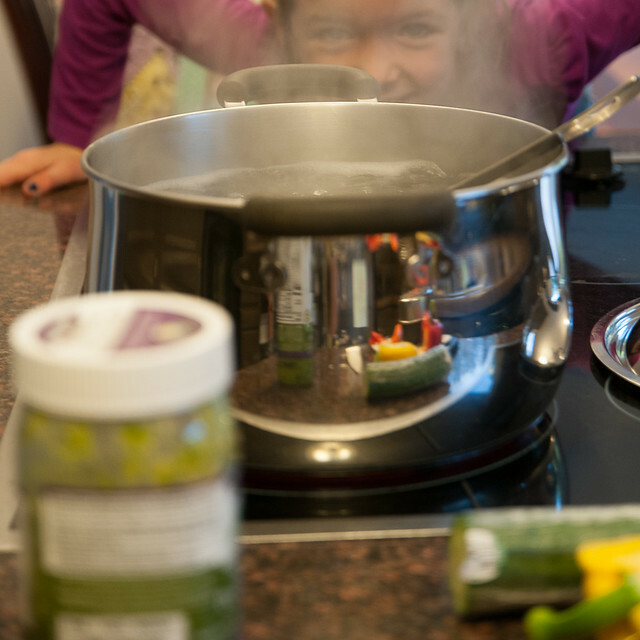 The 'magic' of this dish is in the eyes. 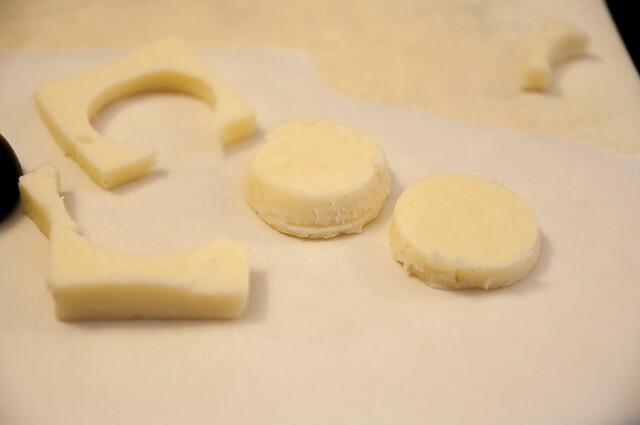 And initially, I thought I would just purchase some of that thinly sliced cheese (the type sold for sandwiches) and maybe pick up a cookie cutter of some sort to cut it out. And this is where I heard the voices of frugality in my head. Pre-sliced cheese is INSANELY expensive (especially when you look at the cost by weight). And it's ridiculous to buy a cutter for the sole purpose of making a single dish. So I just used mozzarella I had on hand (it was a bit of a pain to cut, as evidenced by the slightly ragged edges) and I cut it with a round tablespoon measure. And you know what? 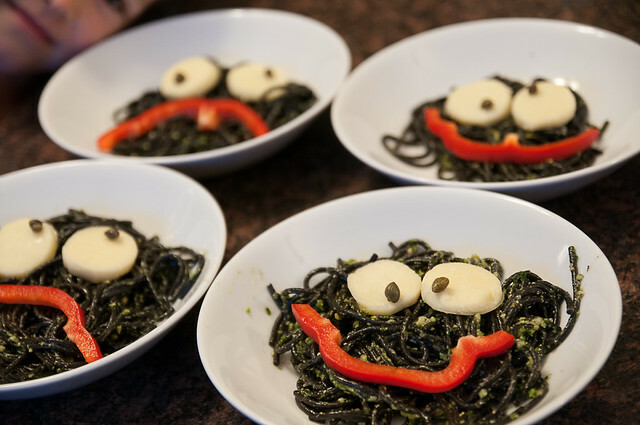 It totally worked, and though my photos are maybe not quite as cute as they otherwise could have been, the kids sure did love this pasta. 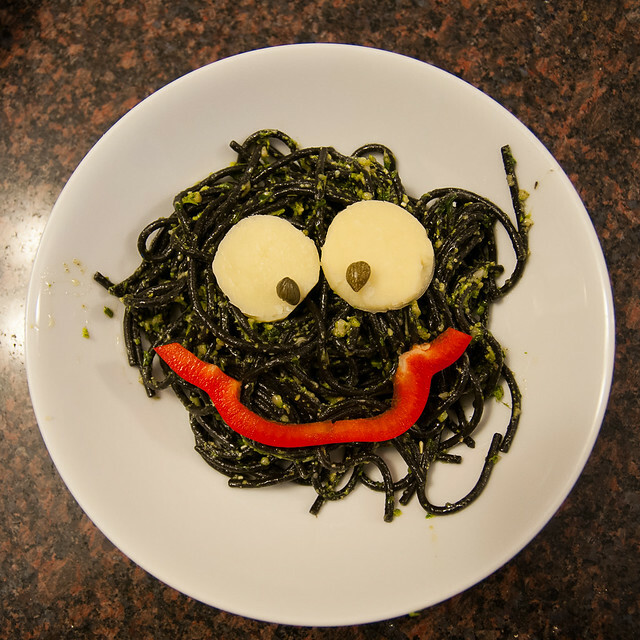 Pesto is almost always a hit in our house, and the bit of fun with the eyeballs and mouth completely made them giggle and the kids were super excited to eat it. I think they had the most fun talking about the various expressions of the monsters, and experimenting with the various positions of the red pepper mouth. 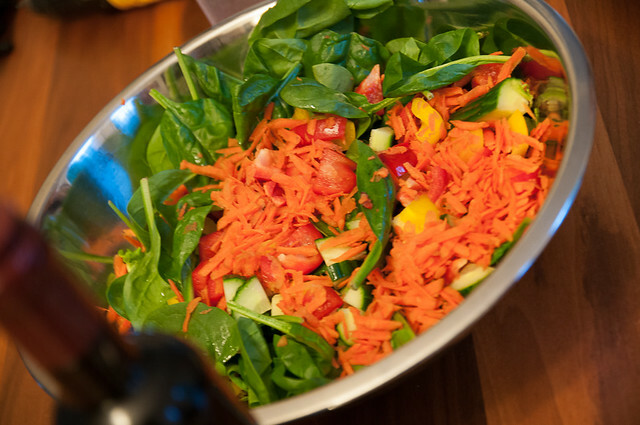 For balance, I served with a nice green salad. Because vegetables. 1. Cook pasta according ot package directions. 2. 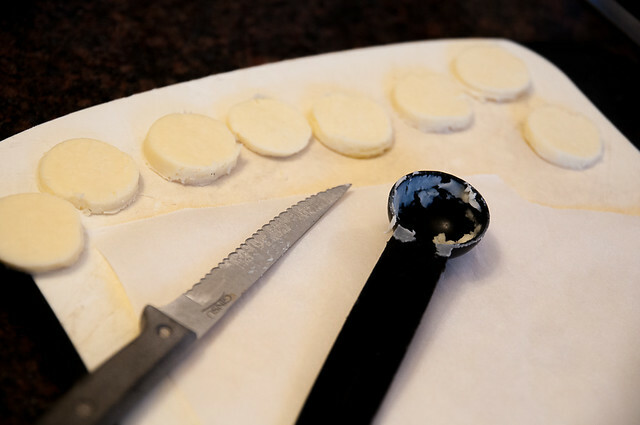 Meanwhile, take thin slices of the cheese, and cut out two circles for each serving. You want the circles to be about 1" in diameter. Give or take. Slice rings from your red pepper, and cut each in half. I left some of the inner white portion attached because I liked how it gave the monsters character. I think I may have put too much thought into this. 3. 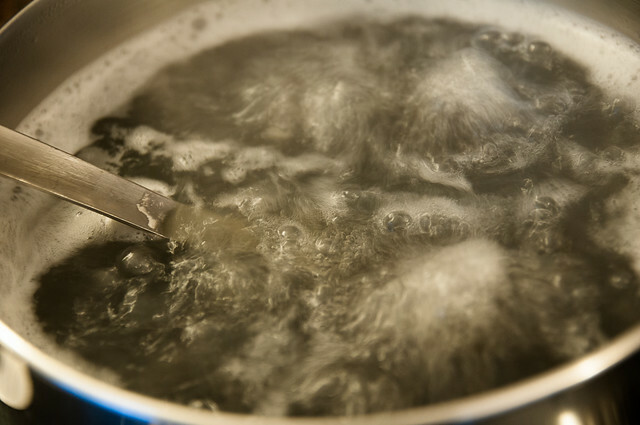 Once you drain the pasta, you can toss it with a touch of olive oil, salt and pepper. I like to, but it's not necessary. 4. 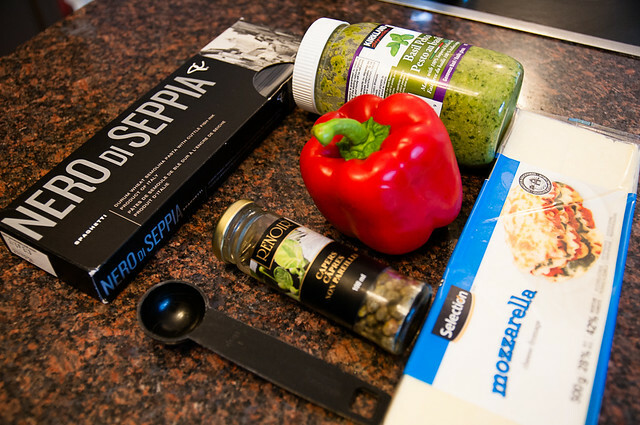 Add the pesto and stir it in. 5. For each serving, top with two circle eyeballs, and then add a caper on top of each. I made sure that hubs' monster was rolling its eyes. Art imitating life and all that. 6. Add a pepper slice for the mouth. And you're done. It's crazy easy. I know there are much fancier hallowe'eny meals out there, but the beauty of this one is that you actually have the time and ingredients to make it. Or you can improvise (don't have capers? Don't buy them just for this.....use olive rings or pickle slices, or anything you can find that gives your monster just that perfect haughty expression. You could even use tofu instead of cheese, if you wanted). So all this to say, I'm trying to quiet that little voice in my head that makes me want to go all spendy, and though I made only a couple of small choices regarding this dish, those are the types of small choices that can keep adding up. I think a service like Raise.com (or Cardswap.ca for my Canadian readers) is a great way to get money for something you don't need, and also to get a great deal on your planned spending. I'm also going to go one step farther and recommend you try to find your local Buy Nothing group. These are great hyper-local gifting communities - so far I've found that it's a fabulous way of getting rid of things I no longer need, but that are not likely to sell, and you never know what you might come across (though I'm still looking to see if anyone's wanting to get rid of an old tortilla press.....I've banned myself from buying additional gadgets that will be infrequently used, but hey, if someone has one gathering dust......). Hee - adorable! 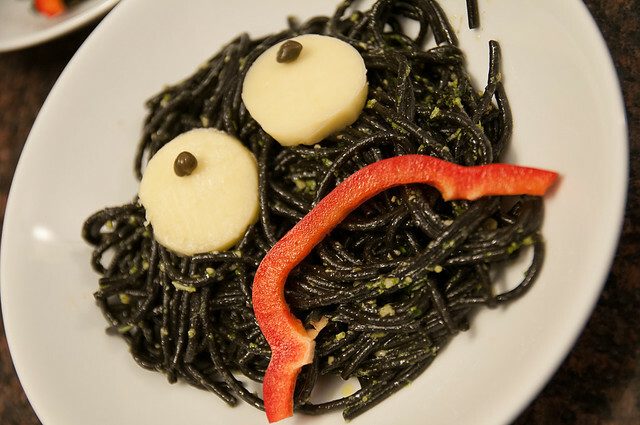 The black pasta is Halloween genius :).